I have a confession to make. I am not nice to my scissors. I use the same scissors for everything - cutting paper, opening those ridiculous plastic clam shell things, opening food wrappers. Anything you would use a pair of scissors for (and some things you probably shouldn't use them for) I do with the same pair of scissors. Just in case you were wondering... this is not a good idea. 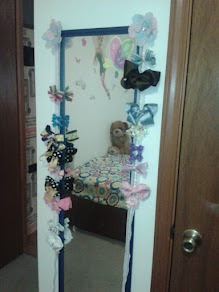 I decided to make bow holders for all my daughters' hair bows. That's them in the picture. Aren't they cute? 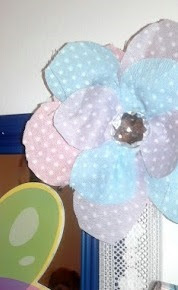 I pulled out the scraps of fabric and got online (you know, the whole crafty Pinterest thing) to find out how to make fabric flowers. I ended up using a combination of two different methods and some of my own finagling, but that's not the purpose of this post. We're talking about scissors today. Anyway, I went to cut the fabric and I had an awful time doing it. It took me forever and the edges were frayed and it was awful. My husband came in and started looking at the scissors. These were nice, name-brand scissors but because I had not taken care of them, they were scraped and gouged and really not good for cutting something like fabric. He went to my daughter's art desk and pulled out a pair of her safety scissors. The kind with the rounded nose and the little finger holes. She has nice safety scissors. They cost me all of a dollar. The important thing is, though, that she's never cut anything but paper with them. My husband picked up the fabric, and I'm thinking there is no way this is going to cut. Sure enough it made a nice, sharp, clean cut. Just look at the difference in the flowers. One is with my damaged scissors and the other with my daughter's safety scissors. What a difference. Life is a lot like that. God gifts us with a lot of things. He gives us talents, promises, and great opportunities. But if we misuse our faith, if we abuse His grace, then when we go to use those things for what they are meant for, we can find them damaged beyond redemption. No, we cannot lose our salvation once we have truly surrendered our life to Christ, but we CAN miss out on all the great blessings He intends for His children. I think about my education. He gifted me with amazing opportunities. I was in a great school district growing up and went to a fantastic college. I got good grades and did well in school, but I certainly did not utilize the opportunity in the wisest way possible. My efforts to just get by and enjoy the ride left gouges and scrapes where knowledge and experience should have been. If my GPA had been higher or I had actually retained more of what I supposedly learned, I would have had a lot more career opportunities and been a better employee coming out of college. What are some opportunities you have misused that caused you to be less effective later in life?